Before you eat, MyPlate can be a reminder of what food groups you should include in your meal. You can use MyPlate at home, at restaurants, in school cafeterias, or wherever you eat. A well-balanced diet includes all of the food groups. These food groups are vegetables, fruits, dairy, protein, grains, and fats. MyPlate is a tool that can help you choose healthy portions of foods from these groups and eat a well-balanced plate at meals. 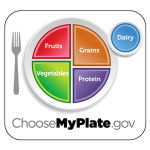 MyPlate is a tool that was created by the US government to promote a well-balanced plate. MyPlate includes the types of foods you should be eating at all of your meals and encourages a balance of portions. By showing a balance of healthy foods, MyPlate can help you get the right amount of energy and nutrients each day. What about the foods that are not shown on MyPlate? MyPlate is a simple image and therefore does not include everything you may eat or drink at meals. For example, water isn’t shown on the plate, even though water is something you should have every day. MyPlate also doesn’t include healthy fats such as olive or canola oil which may be used to prepare food or found in foods such as fish, nuts, and avocados. Foods and beverages that are high in saturated fats and added sugars, such as desserts, chips, and sodas are also not included in MyPlate. Although it’s okay to have these foods sometimes, they aren’t shown on MyPlate because they should not be consumed as often as the other 5 food groups. When can I use MyPlate? MyPlate can easily be used when sitting down to any meal. Does my meal need to look like MyPlate every time? Even though some meals aren’t eaten on a plate, you can still apply the MyPlate principles. For example, a burrito, a slice of pizza, or bowl of soup may not look like the MyPlate picture; however, the MyPlate concepts will still apply. Think about a slice of pizza – the crust (grains), cheese (protein/dairy), and tomato sauce/topped with vegetables (vegetables)! Is MyPlate only for eating at home? The ideas behind MyPlate apply no matter where or what you are eating. At home, MyPlate may be used during family meals, which is a good way to promote healthy habits. For example, planning family meals ahead of time can become easier, since portion control shows you how much everyone should have as a part of a well-balanced meal. Outside of the home, it can be used when ordering from a menu, a buffet line or at a social event. For example, if you find yourself choosing something with only two food groups, have other food groups on the side or mixed in. Where can I find MyPlate? More information about the MyPlate method can be found here. This website includes educational material and tip sheets for families and people of different ages. Some of the online tools include eating on a budget, MyPlate tip sheets and quizzes, and what’s cooking with recipe ideas.